Don’t you just love finding a new author that you really like? I’m so excited whenever I discover someone new. It makes me wonder how I ever got along without reading them before. That’s what I really enjoy about anthologies. I get to discover new authors without having to devote as much time as I usually would. 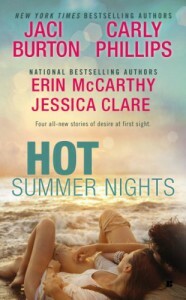 Hot Summer Nights has four authors that you’ll want to start reading, if you haven’t read them yet! Jane is a harried and busy woman. She’s a teacher and has her own two kids to raise all on her own. I liked Jane but thought she was rigid and unfriendly at times. Of course, she has every right to be. But when friends/family want to help her, she generally refuses on principle. Jane doesn’t seem to see how she might come off as a total jerk to others, and she doesn’t take the time to stop, assess her situation, and accept help. Will has had a thing for Jane for a long time. He makes his move, and Jane puts him off and pulls him in, and then puts him off and pulls him in again. I can’t believe he stuck around so long for the abuse! I felt bad for Will because he’s genuinely interested in Jane, but she’s just so unforgiving for every little mistake! In the end, I liked Jane and I liked Will, but I loved them together. Jane kind of transforms and becomes this awesome person who can accept help, and as a side benefit, she becomes much nicer! This was a great story and I can’t wait to read more! Alexa is a very good doctor and has worked incredibly hard to get where she is. I can’t honestly say why I liked Alexa so much but I did. Perhaps it’s because in addition to being an amazing and dedicated doctor, she’s also a great friend to Cara (you may remember Cara from Serendipity’s Finest Book 1, Perfect Fit). When we meet Alexa, she’s trying to cheer Cara up during one of Cara’s low times in her relationship with Mike. Then she meets the man who will change her life. I loved how Luke was able to get Alexa to relax, even if it was only for a short while, and how quickly he was able to break through Alexa’s defenses by being honest, charming, and unexpected. I think a lot of men could learn a thing or two from this fictional character! Despite not loving how Alexa seemed willing to change a lot about herself for this man, or the hard-to-believe fact that Alexa and Luke fell for each other in less than three days, I loved this whirlwind romance! Carly Phillips sucked me right into the story! Luanne has an internet video program where she does silly/insane/stupid stunts under the guise of “Jane.” I loved this idea! I really liked Luanne and had a blast seeing both the Jane side of her and the nice, calm Luanne side of her! I also liked that when she wasn’t Jane, Luanne sat around in some ratty old shorts and talked and argued with her sister. It was adorable! Hank was a little tougher for me to warm up to. He’s portrayed as this super quiet, super tall country boy with a definite line between right and wrong. I could certainly understand why he would take issue with Luanne doing the Jane stunts while she was seeing him. I may not have warmed up to him right away since he was SUCH a straight arrow, law abiding type of guy, but once I saw Jane’s antics from his point of view, I liked him a lot more. I loved Hank and Luanne together! If there was ever a case of two people being more perfect for each other, I’d like to know. She got him to relax a little, and he got her to accept some responsibility and sort of grow up a little. I loved every single scene with them together! Chelsea is such a smartass and so funny in a sarcastic way. I swear we were separated at birth! I lost count how many times I literally was laughing out loud while reading this. “Even my cooter is numb” is an absolutely classic Chelsea line. I love heroines that have sass and a filthy mouth, and Chelsea fits the bill! Brody is more of your standard athletic hot guy, but when he’s with Chelsea, he’s so much more. His reactions to Chelsea are so spot-on that it had me laughing at him as well! Then when Brody is trying to teach Chelsea how to ski…oh, forget it…this story was too damn funny for me to even try to do it justice in a review! Chelsea is amazing, and Brody is great because he enjoys her humor and just lets her roll with it. Any guy who can let his woman be funny is excellent in my book. They are so cute together that I couldn’t help but fall for them as a couple! If you haven’t read some of these authors, this would be a great opportunity to try them out to see if you like their writing. On the other hand, if you’ve read all of these authors, this is an anthology you HAVE to get because each story is great! I loved this collection of novellas, and I’m hoping we get a chance to see all of these couples again in the future.